Listen to Canadian electronic music artist ThirdTemple. License music for advertising, tv, videos and games on Rumblefish. Free mp3 downloads on SoundCloud. Raphael Cohen, Producer of ThirdTemple was raised on electronic music for a big part of his life. “I was influenced by the New Wave bands of the 1980’s like New Order and synthesizer bands like Kraftwerk, OMD, Yello. The Beastie Boys, Chemical Brothers, BT, FSOL and The Crystal Method in the 1990’s”. “The first vinyl single I ever bought was Pop-Muzik by M. I loved the arpegiated-type synths and bass sounds. Other favorite songs included Cars by Gary Numan, Oh Yeah by Yello, Funkytown by Lipps Inc, I feel love by Donna Summer and The Robots by Kraftwerk. There was always music playing in our house and my father was an artist in Morocco known as Leony Elmagribi. The computer revolution of the last decade has given way to a proliferation of possibilities for musical artists to express themselves using software synthesizers and virtual samplers. 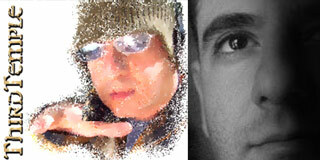 Raphael, a graphic designer and web programmer; discovered and found inspiration in this new world and soon began producing Techno House beats with his computer sampler. He grew these into an original project which he calls ThirdTemple. ThirdTemple pushes the boundaries of the genre, introducing instruments and samples that are not commonly used in modern electronic media music. Exotic African drum beats and Latin grooves are only a small part of the arsenal he uses to make his beats come alive. One might expect to hear his raw, unabashed grooves on an action movie soundtrack or on a pumping European dance floor. “Mister President” from Sanctuary is about how our leaders have failed the most vulnerable among us. While the desperate cry of the hungry child keeps calling, our leaders keep fiddling in their lonely mansions ignoring their heart-rending pleas. Mystical Techno 101, the first ThirdTemple CD employs layers upon layers of World Beat, Techno, House and Drum n Bass percussion and synthesizer sounds, building a flowing soundscape that pulsates through to the soul. “I never make a track that I can’t move and dance to… physically and mentally,” says Raphael. Raphael plays the part of musician, producer, mixes and sound engineer for ThirdTemple. License ThirdTemple for TV, games, videos and other media. What are people saying about ThirdTemple?